Caption This year's Boat Show will be held on Sunday June 25 2006 at the beautiful Corinthian YC in Tiburon from 10:00 am to 4:00 pm. Members take pride in giving the public a close look at their wonderful boats and sharing their history and there will be model boat building for kids too. The gate fee is $10.00 to the public which includes a detailed program of attending boats. Children under 12 free but must be accompanied by an adult. Free to MMBA members with boats in the show and regatta sponsors. The boat show proceeds go towards our Benevolent Fund which provides funding for either sail training scholarships or skills associated with restoring traditional sailing craft. 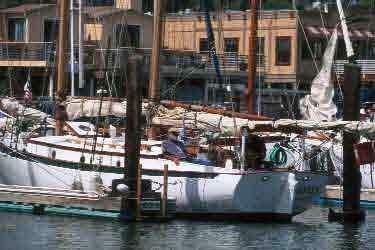 Headline Late JUNE: Mariners show off their ship shape creations in Tiburon.